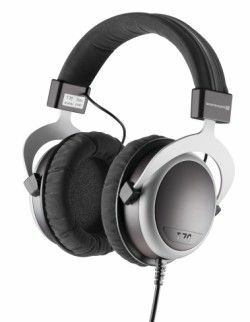 MUNICH SHOW: Beyerdynamic launches two pairs of premium headphones | What Hi-Fi? Beyerdynamic is debuting its new T70 and T70p headphones at this year's High End Show in Munich. The closed-back, over-ear headphones are set to retail at around £450 and represent the most affordable models in the company's flagship Tesla range. Handmade in Germany, the T70 headphones, with a standard impedance of 250 ohm, are aimed at home listeners, while the T70p cans sport a low impedance of 32 ohm and are aimed at less powerful, portable devices. A noise-isolating design, the headphones' headband and earpads are designed for comfort over extended periods and even claim to keep the temperature balanced. On the outside the T70 heapdhones are finished with a three-layer varnish that changes colour 'from dark violet to mud tones' under light. The cans come with a carry bag, headphone cable - 3m on the T70, 1.2m on the T70p - and a set of jack adapters. The T70 range sits above the impressive Beyerdynamic T50 models and is set to be in stores in the UK from July.